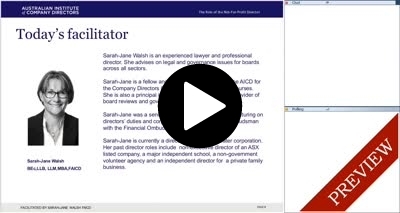 This introductory session outlines the duties and responsibilities of directors with specific focus on the not-for-profit sector. The webinar will explore questions that all NFP directors should consider. For further information on the NFP sector please take a look at ‘NFP Governance and Performance Study 2018’ webinar. Register for three or more webinars of your choice in one transaction, and you can take advantage of our bundle and save promotion. Receive 10% discount for three webinars or register for five or more and receive a 15% discount. *Series webinars are exempt from this offer.